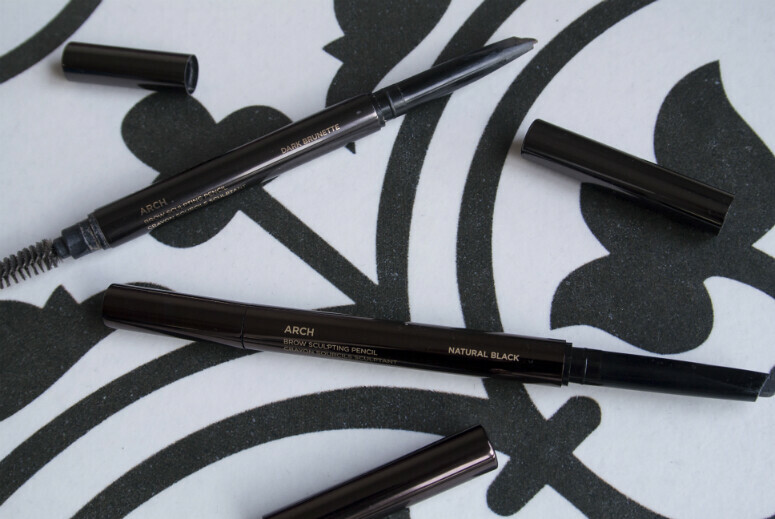 The Hourglass Arch Brow Pencil has been something that has been in my makeup routine for some time now. Its wide nib deposits a wonderful waxy formula that holds my hairs into place, and in the easy format of a pencil which I get on with really well. I can alter the way I'm holding the pencil so that the angle is different for whichever purposes I needed it. Trying to draw in extra hairs, or add fullness in different areas, this does everything. What's even better is that the colour range has finally been extended. I was using Dark Brunette which leaned a teensy bit warm in the brown territory for me. I much prefer mine with a grey base, and Hourglass have answered my prayers, and probably the prayers of many other people, because they've added not one or two new shades, but six. SIX. I bought myself the shade Darkest Black. I know the recommendation is to go a shade lighter than your natural hair colour, but considering how my hair is very dark anyway, and the fact that this has a very ashy-grey base, it really does work. I always reach for my Hourglass eyebrow pencil because I can work very quickly with this and still get really good results, it comes with an excellent brow brush (they should sell this as a separate tool I think! ), and stays on all day. When I say all day, I really do mean it. My foundation may slide, my eyeliner may smudge, but my eyebrows look exactly the same as they did in the morning when I first put my makeup on. Now that they've added just the colour I need, what more can I ask for? If you haven't tried this out, you might not get the hype, but believe me, it really is worth it! Get yourself to a Space NK now and try it yourself! I've been wanting to try out a pencil brow again, thanks for this post I'll look out for this and give it a try! Love that it comes with a brush too.. very handy!